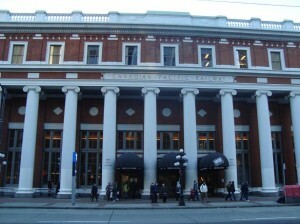 The Roundhouse is home to Canada’s first transcontinental locomotive to arrive in Vancouver. Canadian Pacific Railway’s Engine number 374 brought the trainload of 150 passengers along the newly completed 12 mile extension from Port Moody to Vancouver on May 23, 1887. The Roundhouse was built in 1888 by the CPR in the Yaletown area. It had a turntable for redirecting locomotives and a service building to house and maintain CPR’s locomotives. The mighty interior cedar columns and brickwork walls hint at the lumber mills, rope works, railway sidings and engineering shops that once dominated the False Creek landscape. 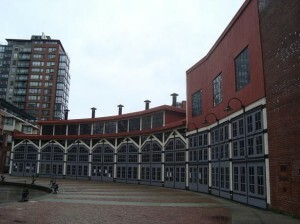 Today it is the Roundhouse Arts and Recreation Centre. Inspiration for the CPR station design was taken from New York’s Pennsylvania Station. This is the third station to be built on the site, the first being a wooden structure in 1887 and the second being a chateau style edifice in 1898, and the third being the current brick structure completed in 1914. The station was designed by architects Barott, Blackader and Webster. 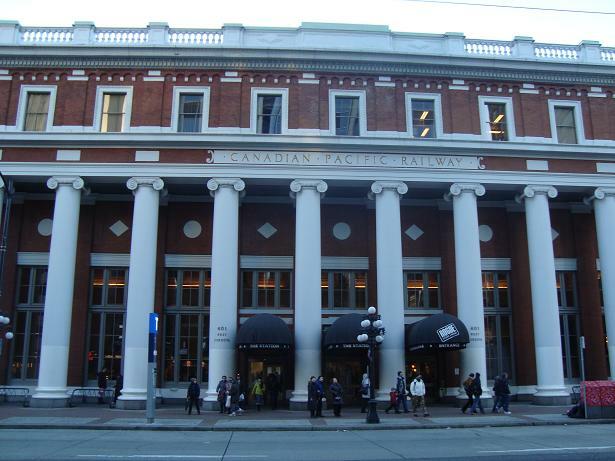 It has a Neo-classical columned facade and a pilastered waiting room with romantic Victorian styled painted murals on the walls depicting Canadian landscapes one might see while riding the train. They were painted by the wife of a CPR executive. It is a magnificent monument and one more jewel in the crown for the sea to sea vision of the forefathers of Canada. In 1977 it became the terminal for the Seabus service to the North Shore and in 1985 it expanded its use becoming the last stop for the Skytrain rapid transit service.